Evacuation Scenario. 200 agents evacuating a building. 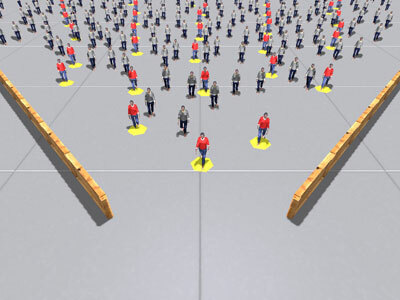 Shy agents (brown shirts) hold back while aggressive agents (red shirts) dart forward. The other personalities also display a variety of behaviors such as quick maneuvers, overtaking and pushing through. Four highlighted agents move transversely through crowd. 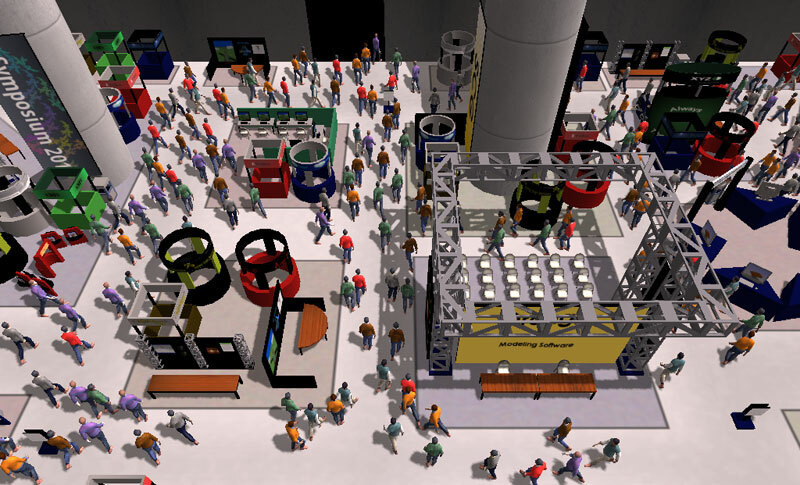 Paths of four agents trying to push through a crowd in various simulations. 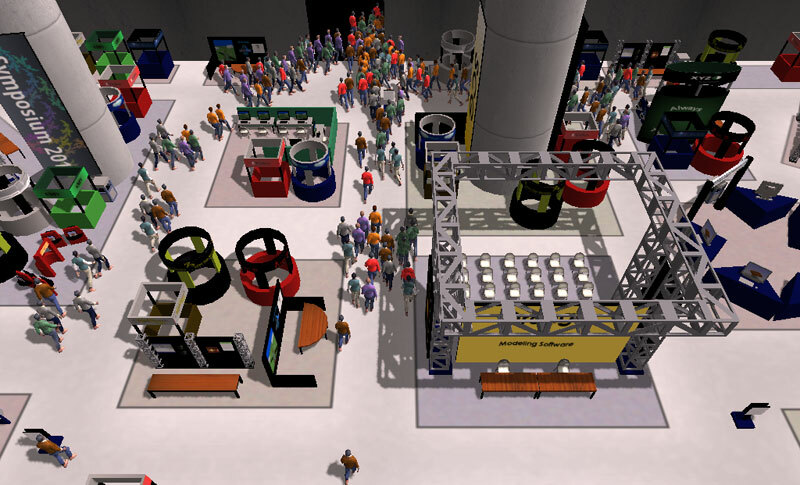 The agents are given parameters corresponding to various personalities. All paths are traveled for an equal length of time. (a) Aggressive agents make the most progress with the straightest paths. (b) Impulsive agents move quickly but take less direct routes. (c) Shy agents are diverted more easily in attempts to avoid others (d) Tense agents take less jittery paths, but are easily deflected by the motion of others. 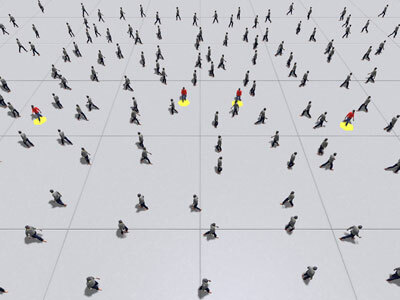 Four highlighted individuals move through groups of still agents. A comparison between (a) agents with high levels of "Psychoticism", (b) "Extraversion" and (c)"Neuroticism". Each of the four agents’ paths is colored uniquely. The high P-factor agents repeatedly cut close to others taking the most direct paths. 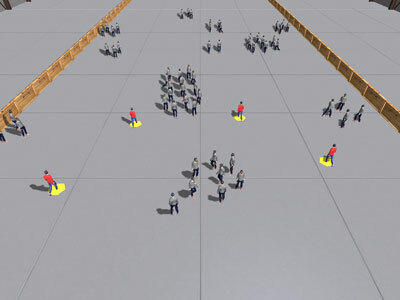 The high E-factor agents take faster and occasionally "daring" paths, the high N-factor agents take more indirect paths and keep their distance from others. 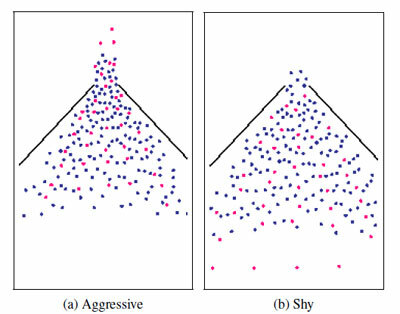 A comparison between dark-blue default agents and light-red Aggressive agents (a) and light-red Shy agents. (b) The Aggressive agents exited more quickly, while several Shy agents stay back from the exit causing less congestion.